The Moray coastline has a string of superb sandy beaches, and towns such as Buckie, Lossiemouth and Nairn (historically part of Morayshire) have long been popular for family holidays. For the walker there are cliffs, arches and stacks as well as sand and dunes, whilst offshore it may be possible to glimpse the famous Moray Firth dolphins. Set back from the coast are fine stone-built towns such as Forres and the small Cathedral city of Elgin. From here heading southwards the character of the countryside changes to one of wide, spacious glensand sweeping, purple heather moors and hills. 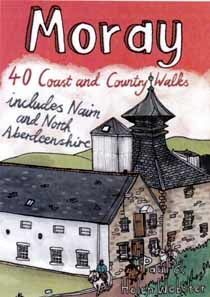 This is Speyside - Malt whisky country par excellence. The main centres here are Keith, Aberlour and attractive Dufftown, as the hills slowly merge into the Cairngorms National Park. This latest pocket guide features 40 of the bestwalks in this popular area in an attractive and accessible format.